By Ron And Mary V.
Iian and Xavier were the Foreman who raised my concrete. Iian, explained thoroughly what was to take place and the expected results. Not only were they both thorough and professional but my expectations were exceeded. The end result was an excellent job that not only feels nice and level to walk on but looks good too. Thanks Quality 1st! I wanted to shout out to a couple of your team members that were amazing. On September 6 we had some concrete work done on our front porch/walkway. Iian Grooms and Fermin Bermuduc worked so hard in the 95 degree (or higher) heat that day and did an outstanding job. Iian communicated with us through out the afternoon letting us know what was going with the work. In the end the front porch and walkway look fantastic. Andrew Gagliardi was the sales rep for this project. We had a situation - Andy handled it and we were able to complete the project on time. Thank you to Iian, Fermin and Andrew! We appreciate all you have done. Our front porch was repaired by Iian Grooms and his crew. They were true professionals. Iian proved to be very courteous, knowledgeable and informative, answering the many questions we had during the repair process. We are pleased with the outcome of this repair, hoping never needing to make use of the warranty but in case we do we hope Iian will be the guy for the job! I have used them to lift a few slabs on my driveway. Had one minor issue in the first year and they came out no questions asked and made it right. I would recommend them to anyone and would absolutely call them again. I thought I would need $20000 of work based on estimates I got to replace my otherwise good concrete slabs. They came out and for way way way less $ solved my issue. I can’t recommend them enough! I had PolyLevel done to a concrete patio which settled and pitch towards the house causing a puddle by my back door when ever it rained. It’s been over 10 years and every thing still good! They left no mess and it was done quickly and relatively inexpensive. The sidewalk leading up to the stairs at this home in Newfield had settled, creating a large trip hazard. After hearing about PolyLevel on Facebook, the homeowner contacted Quality 1st Basements to inspect their concrete. A Concrete Repair Specialist headed out to the home and created a plan to raise the concrete. On the day of the installation, our team raised the slabs by injecting Polyurethane foam beneath them. Once the slabs were leveled, the team applied NexusPro Joint Sealant to seal off the area and prevent water and wind from eroding the soil beneath the slabs again. The area is now completely trip hazard free and safe for pedestrians. We were able to ensure this homeowners peace of mind by removing the trip hazards in front of their home. Our team lifted and leveled the concrete with Polylevel and sealed the joints with NexusPro Joint Sealant. The walkway is now trip hazard free and the homeowner no longer has to worry about guests injuring themselves when entering or exiting the home. Check out the great work done by Concrete Foreman, Iian and his team. A homeowner reached out to us for a solution to the sinking concrete driveway they were experiencing. The apron of the driveway had settled causing small dips in the driveway. Every time a car pulled in or out it would hit the dip. The homeowner wanted the apron of the driveway lifted so that they would't have to worry about tripping over it or it settling even further. Using PolyLevel Foam, Our Team led by Iian, raised the concrete back to level, removing the trip hazard and permanently stabilizing the concrete. Quality 1st Basements removed the trip hazard near the steps of the shallow end of pool by raising the sinking slab back to level. Our team drilled small, penny-size holes into the concrete slab and injected Polyurethane foam known as PolyLevel below. PolyLevel is a light weight foam that expands to lift the heavy slab. Once the slab is leveled, the foam hardens to stabilize the slab to prevent future movement. To create a safer entryway to this building, our team lifted and leveled the front walk enterance removing all trip hazards. Once the slab was leveled, our team sealed the joints with NexusPro joint sealant to ensure that the soil beneath the slabs would be protected from future erosion. Proof is in the pudding! Or in this case in the PolyLevel! Concrete raising is easy with our Concrete lifting solution. PolyLevel is a polyurethane foam that is not only waterproof but environmentally friendly as well! Don't replace your concrete slab, raise and stabilize them! An uneven sidewalk is not only an eyesore, but it can be extremely dangerous to pedestrians. To remove the trip hazards created by the sinking and settling concrete, our concrete repair team injected PolyLevel beneath the slab. PolyLevel is a polyurethane foam that is extremely strong and durable. When it hardens beneath the concrete, it is able to stabilize the slab and withstand the weight for years. PolyLevel does not break down, it is waterproof and environmentally friendly. The sidewalk is now permanently stabilized and safe for pedestrians again! A homeowner in Toms River, NJ was experiencing concrete settlement around their pool deck. Our PolyLevel Team was able to lift and level the concrete to eliminate tripping hazards. First, our foreman, Iian and his team drilled small penny sized holes into the concrete. Next, they injected the polyurethane foam beneath the slab to lift and level the sinking concrete. Once the slabs were level again and the small holes were filled, the concrete was as good as new! Worried about the safety of their family and nieghbors, a homeowner called Quality 1st Basements to raise their sinking concrete. Not only was our team able to lift and level the uneven concrete with our concrete raising solution, PolyLevel, they were also able to seal the cracks to prevent future erosion. Our Concrete Lifting and Leveling crew injected polyurethane foam known as PolyLevel underneath these settling slabs to raise the concrete back to level and remove the trip hazard on the sidewalk. Sinking concrete is caused by weak soil beneath the slab. The soil is too wet, too dry or just poorly compacted and can no longer support the weight. Our team uses our State-Of-The-Art polyurethane foam, PolyLevel to raise the slab and create an even sidewalk path. A homeowner noticed that the concrete sidewalks in front of their home were sinking and settling- causing trip hazards for their friends and neighbors. Jay, one of our Concrete Repair Specialists determined that the concrete could be lifted with PolyLevel. Our team led by Iian, went out and injected polyurethane foam and raised the concrete back to its original position. The sidewalk is now trip hazard free and the homeowner no longer has to worry about anyone falling and getting hurt. The concrete walkway of this Eatontown, NJ was sinking and settling. The homeowner was frustrated that although the concrete was in perfect condition, the settlement meant they had to replace it. 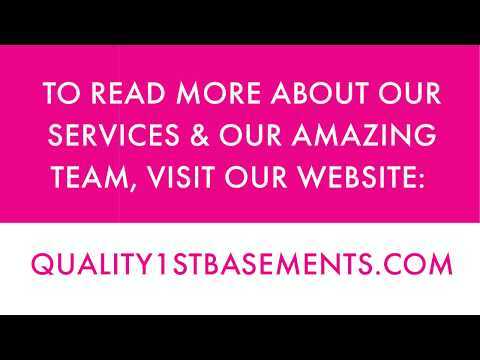 Luckily, Quality 1st Basements could offer them an alternative to replacement- concrete raising. Concrete Repair Specialist, Jeff P.,recommended PolyLevel, our concrete raising polyurethane solution. Our system will raise the concrete slab back towards it's original level without causing any disruption to the surrounding area. It is environmentally friendly and waterproof as well! Homeowners can walk on the concrete instantly after installation is complete. Check out the results from the amazing installation work done by Concrete Foreman, Iian, and his team! A homeowner in Short Hills, NJ was in need of concrete repair services in their garage. The concrete slab had settled and was becoming a trip hazard. Our PolyLevel Team was able to raise the concrete by injected the polyurethane foam beneath the slab through penny-sized holes drilled. The homeowner was extremely happy with the results and no longer has to worry about tripping when walking into the garage. With help from Concrete Repair Specialist, Andy and our Concrete Repair Foreman, Iian, Quality 1st Basements raised and leveled this entire front walkway in front of this building located in Secaucus, NJ. PolyLevel was injected beneath the sunken slab to raise and stabilize the slab. The small trip hazard created from the uneven concrete was removed. Jeff, our Concrete Repair Specialists, provided the homeowner with an estimate to lift, level & seal the area. Iian, our PolyLevel Foreman and his team were able to raise the slabs back to level. First the crew did a full walk through to make sure nothing was in the surrounding area that could delay or effect the installation. Once the area was clear, the crew began installing the polyurethane foam. Small holes were drilling into each sinking slab. PolyLevel is injected beneath the slab to fill the small void below. PolyLevel expands underneath, raising the heavy slab. When the slab is raised and no additional foam is needed, it begins to harden for permanent stabilization. With help from both our System Design Specialist, Jay and PolyLevel Foreman, Iian, Quality 1st Basements was able to provide a permanent solution to the sinking patio area in Old Tappan, NJ. The homeowner had contacted Quality 1st when they got tired of the puddles forming in the middle of their patio from the settlement. They wanted to avoid replacing the patio area at all cost. Iian was able to lift all for sinking slabs back to level, removing the dip in the patio. Now with the patio leveled, water would no longer get trapped in the middle and simply flow towards the grass.